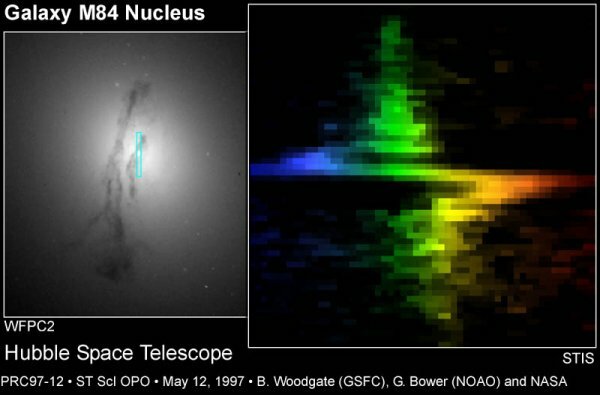 Observations of the centres of nearby galaxies, including our own have shown that there has to be something extremely dense present. Astronomers can even see the stars at the centre of our own galaxy move around some invisible mass, and from the speeds that the stars are moving, they can tell that the black hole is only one million solar masses. This is one of the reasons why we cannot see it, but the other one is that it is not feeding at the moment. In the centre of the nearby galaxy of M84 we can see the effect of the accretion disc as some of the light is blue shifted and some is red shifted1 around the centre. Astronomers know that M87 has an AGN because it produces a jet of material and there is very strong radio emission associated with the galaxy, see Jets. X-ray astronomy has helped to confirm that SMBHs exist and are present at the centres of AGN. Some spectral lines2 occur in the X-ray realm of the electromagnetic spectrum, the Iron K line at 6.4keV is one of the most used. The line is no longer a sharp peak but spread out in a distinctive shape which results from the relativistic effects which are expected to occur close to the black hole. The extent of the line to low energies, the "red-wing", depends on from how close to the black hole there is emission from the accretion disc. If there is a "blue-wing" then the disc is more edge-on. In some AGN the variation of the X-ray emission depends on the energy observed. In the case of the galaxy MCG-6-30-15, the spectrum can be modelled as two components, one coming directly from the X-ray source, and one which has been reflected off the accretion disc. These two components vary with respect to each other, and this has been interpreted as there being a bright source above the accretion disc which varies its height. We have already seen that massive objects can bend light, and close to the black hole this is very much the case. The closer to the disc the bright source is, the more of its light is "pulled" towards the disc and is reflected back to us, whereas when it is further away, the amount which is reflected to us is similar, but more reaches us directly. Recent observations seem to indicate that this model exists elsewhere in the Universe. Below is the spectrum of NGC 3516 plotted against time. Blue regions in the plot indicate that at that time there is a large amount of emission at a given energy, and black regions means that there is little emission. There is evidence for a periodic variation in the spectrum of this source; this may be the result of a flare moving around the black hole, and the redshift in the light caused by its motion and the gravity of the black hole produces the features observed. For the paper detailing the model click here. This data allows the calculation of the mass of the Super Massive Black Hole as 1-5 x 107 times the mass of our Sun. 1: Red and Blue shift are as a result of the Doppler effect on light. The Doppler effect will be familiar as the change in pitch of a siren or motorbike engine as it passes you at high speed, from high to low. As the source travels towards you the sound waves are compressed and so sound higher pitch, and then as it moves away from you they are stretched out and so sound lower pitch. This effect happens with light when the light source is travelling at large fractions of the speed of light, which can occur when in orbit around a black hole. If something is blue shifted then it is moving towards you, the light waves are compressed and appear at higher energy, towards the blue end of the spectrum. Red shifted is the opposite. As the Universe is expanding galaxies appear to move away from us, and so their light is red shifted, which is why astronomers measure distances in Redshift when talking about the large scale structure of the Universe. 2: Spectral Lines are dips or peaks in a spectrum. They occur because the electrons in atoms can only exist in specific energy levels. They jump between these levels when they absorb a photon of the exact frequency corresponding to the energy change required or if they emit a photon of that frequency. If they absorb a photon the lines are dips (dark lines), if they emit a photon the lines are peaks (bright lines). Published 1996-2005 by the Institute of Astronomy X-Ray Group. Last Modified on 2005-04-28. Comments to the xray-webmaster at ast.cam.ac.uk.